Let’s admit we all swoon over the size of kitchens we see on some blogs, on Pinterest, and in magazines. The lavish spaces with huge dining tables, multiple worktops, and spaces for decorative items are like dream kitchens we all want. This dream, however, looks unachievable unless we plan for it and that too would require a long time. So, what can we do to make the available small space attractive? After all, we spend quite a good amount of time in this part of the house. The more aesthetically pleasing it will be, the more we will enjoy chores (even doing dishes). As a first step, get rid of the false ceiling from the kitchen. These ceilings make the illusion of cramped space, and we don’t need that. The opening up of a ceiling will instantly give it a larger look. By removing the false ceiling, you’ll have an extra space to decorate the cooking station. You can place nice houseplants on top of the cabinets or have a fancier light. Most probably you’ll only get about a foot more height but believe us; it will make the kitchen appear so much airy and bright. Once, the false ceiling is remover all you have to do is plaster it and paint in some cool colours. We would advise you to go for the basic colours like white, off-white, ash-green, and others from a similar range. Remove the wooden or laminated front doors of the cabinets; they make your kitchen look congested and overstuffed. A few cupboards with glass doors will make your kitchen appear splendent. The glass doors serve the same purpose as the wooden ones that are to protect the dishes inside them from the grease. The only difference is they will do it more artistically. The eyes would travel to the back of the cupboard through the front to create a delusion of a wider space. You can even add spotlights inside the cupboards to give your glass dishes a glow. By adding spotlights in the cabinets, your kitchen will give away the cleaner effect. The only drawback of the glass front cupboards is you can stuff them with whatever you want and however you want. You have to arrange the contents neatly to make it look presentable. Mostly, people opt for serve ware, glassware, or nice containers for the see-through cabinets in their kitchens. If you don’t want to add a lot of glassy touch to the kitchen then, you should go for the open shelves. It will be a little trickier than the glass ones though. The glass doors hide dust to some extent, but when the shelves are open, they need to be cleaned regularly. This will create more storage space in the small meal preparing space. Sauces, spices, lentils, and other items that do not need to be refrigerated can be placed on the open shelves. Since these items are usually in bottles and containers, it will be easy to wipe them clean every now and then. To tell you guys the truth, shelving is the cheaper option than installing cabinets. You can play with the shelves as in placing the decorations. Imagine an indoor plant inside the cabinet how odd it will look, but a small succulent in an open shelve between the kitchen items will definitely add beauty to the place. The shelves can be customised according to your taste and needs. You don’t have to buy really expensive ones, as a matter of fact, simple wood planks with shelf brackets would do the trick. Remember this tip for every part of the house and not just kitchen that pale colours can do wonders. They somehow almost magically make the place larger and roomy. Play with the black and white or some similar colour combinations. Mix and match can add so much to the close spaces, but it can go horribly wrong too. 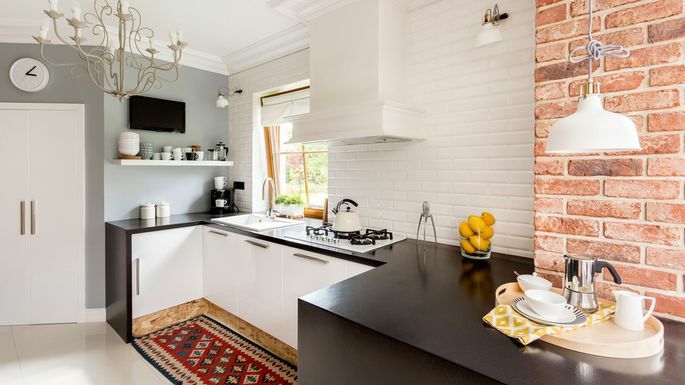 Try to use a dark colour only to the half part of the kitchen because painting the whole thing in dark colours would make it look even smaller and shady. Keeping the kitchen in only two colours look pleasant and give it a cleaner look instead of making a jumble of colours here and there. The more colours you’ll add the more eye soring it will become. Don’t rely on the traditional horizontal drawers as they take up more room and store fewer items. Install vertical storage rails to make the walls look taller and kitchen tidier. The vertical storage looks slender and adds a very nice touch to the clean effect we all want to create in our kitchens. Utilise the space under the cabinet and display mugs there. You just have to put some nails and hang the mugs that are it. Mugs can create clutter on the shelves, and with hanging them, you can get rid of the mess. The spaces above the cabinets and on the refrigerator are the nicest places to have your interior designer traits satisfied. Try to buy some cheap vases or large baskets. You can find many valid online coupon codes if you search the internet a little. Make use of these discounts for buying trivial items like baskets and vases for the kitchen. If you have some utensils that you are not using currently but may use in future or just don’t want to throw away, keep them in the baskets. Place these baskets over the cabinets or on top of the refrigerator. It will look a lot better than keeping the miscellaneous items directly. It will also be easier to find an item when required, and the chances of misplacement are thin. Rotating circular shelves in the small kitchens are lifesavers. If you have a small cabinet then placing a rotating shelf inside it would make storing clutter-free, and all the items inside the cabinet would remain in your reach. You won’t have to empty out all the contents to get something that is way behind inside. Absolutely nothing will get lost at the back. The most important thing is to keep a check on all the utensils and products in the kitchen. You don’t have to keep all the mismatched mugs, rusted utensils, and the things which haven’t been used since ages. This is the stuff which actually creates a mess, and our kitchen seems untidy.